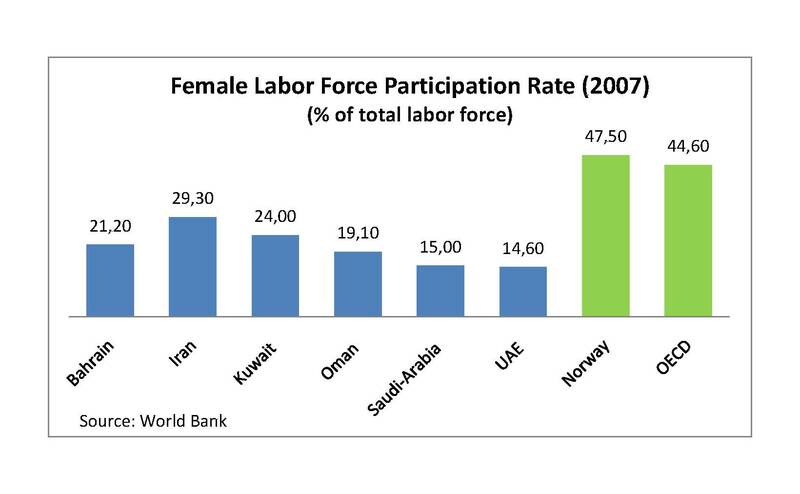 In my last blog post I had collected the female labor force participation rate for several countries in the Gulf region and presented them in a diagram. In this blog post I would like to dwell a little with these figures. The Female Labor Force Participation Rate is defined as female share of total labor force and this might intuitively seem quite straight forward. The fact that the figures are collected from the same international sources indicates that they are collected in a way that is comparable across countries. However, when producing this statistics, international organizations usually have to rely on information from national agencies. Although effort has been made to coordinate the data collection, there are always possible that countries are not measuring exactly the same variable in exactly the same way. A problem of particular interest when studying labor force statistics in the Gulf Region is how to deal with the migrant workers. In Saudi Arabia, foreigners account for more than half of the total labor force. One could decide not to care. A woman is a woman and as long as she lives in Saudi Arabia her participation in the labor market is equally important whether or not she has a Saudi citizenship. However, migrant workers in the Gulf region are not a well-integrated part of the society. They do not have the same rights and privileges and are normally not moving to a Gulf country to settle down with their family and build their life in this new society. Rather they work there in order to send money home and help providing for their families in their country of origin. If one wants to study how culture and religion affects women’s labor supply decision in for instance Saudi Arabia, it might be that foreign women are not bound to the same unwritten norms and barriers and therefore have a more easy access, or at least that their decisions are made based on other criteria than those faced by Saudi women. Another problem is work performed in the informal sector. Labor force participation rate is normally calculated as share of economically active population which again is defined as a person that provides labor in exchange for cash or non-cash income. To what extent this includes the informal sector is unclear. An example is Iran: In the statistics I presented last time, Iran was represented with a female labor force participation rate of almost 30 percent. However, in an article I recently came across by Valentine Moghadam, a professor in Sociology with special interest in female labor in the Middle East, it appears that in Iran’s last census, women constitutes only 15 % of the formal sector. The problem is not that the figure from the World Bank obviously includes (at least part of) the informal sector, but that it is hard to tell to which extent this is the case for the rest of the countries. The main theme in the first issue of The Economist in 2010 is the increased female labor force participation rate (FLFPR) in the US, which is about to cross the 50 percent treshold within the next few months. This is celebrated as a victory for the gender equality and considered to be beneficial for the economy as a whole. The picture is quite different in the Gulf region. In The World Bank’s MENA Development Report from 2004 it is stated that “MENA’s rate of female labor force participation is significantly lower than rates in the rest of the world, and it is lower than would be expected when considering the region’s fertility rates, its educational levels, and the age structure of the female population. This chart presents figures from 2007 for the countries in the Gulf region (exept Iraq where data was unavailable). The FLFPR range from 15 % in Saudi-Arabia and United Arab Emirates to 29% in Iran, which is still considerably lower than the observed 45% in the OECD countries. Scientists debate the cause for the low FLFPR relative to other parameters used to measure gender equality in this region and a general line can be drawn between those in favor of an cultural explanation, and those advocating a more structural cause. Michael L. Ross, professor at UCLA belongs to the second group. In his article “Oil, Islam and Women”, published in American Political Science Review in 2008, he argues that the causal effect goes through the large oil rents in the region: Assuming that women only works in the traded sector, e.g. the textile industry, high oil rents will reduce the traded sector’s ability to compete and force the female workplaces out of buisness. Consequently the demand for female labor, and hence the female wages are reduced. Men working in the oil industry will at the same time earn higher wages. This gives rice to two effects that both have a negative effect on women’s decision on whether or not to enter the labor market. When femal wages drop below the reservation wage, women prefer to stay home rather than participating in the labor market. This is the substitution effect. Leisure and household production become relatively more attractive. At the same time you have the positive effect on the households total income from higher male wages. The need of a second income in the household is reduced. In his paper, Ross finds that oil rent has a significantly negative effect on women’s labor force participation, and that Islam, measured as the fraction of Muslims in the population, has no significant effect.